The United States of America is the world’s greatest super-state with the largest economy/global GDP; the most powerful military machine in history backed by the largest arsenal of nuclear weapons in existence. It’s ‘sidekick’ in the Middle East is the state of Israel. The American principal and its Israeli satellite, work in concert to control both the global economy and international politics through their combined position in the United Nations and through the economic and political power of the US Congress. All this is done publicly with no attempt to hide this extraordinary blatant, bilateral US-Israeli agenda. That agenda is to overtly increase its economic and political power to the exclusion and at the expense of the rest of the world i.e. the other 191 member states of the United Nations General Assembly. This is no secret pact but a stated aim of the US President. 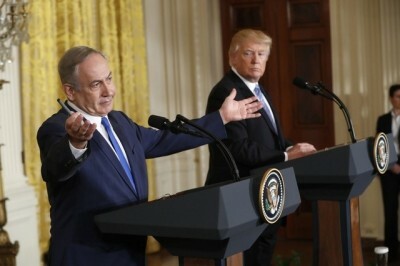 ‘America First’ means just that, including of course its creature state, Israel, which was established in 1948 solely, at that time, thanks to the pressure exerted by the American Zionist Committee, now better known as AIPAC. It has always been a matter of conjecture as to whether, in essence, America exploits Israel or vice-versa. Both mutually benefit enormously by their undue influence over world affairs, and have done so for the past half century under successive American presidents. However, it is only now in 2017 that international affairs, in general, are in the hands of not only these two heads of state but also that of their families i.e. wives, children, sons in law and various other unelected family intimates. Currently, certain individuals within this bilateral family grouping are being officially investigated for corruption, bribery and/or fraud. This does not, however, appear to have had any impact upon their global political activities. The question is: when did Democracy, Justice, Equality and the Rule of Law, all die?